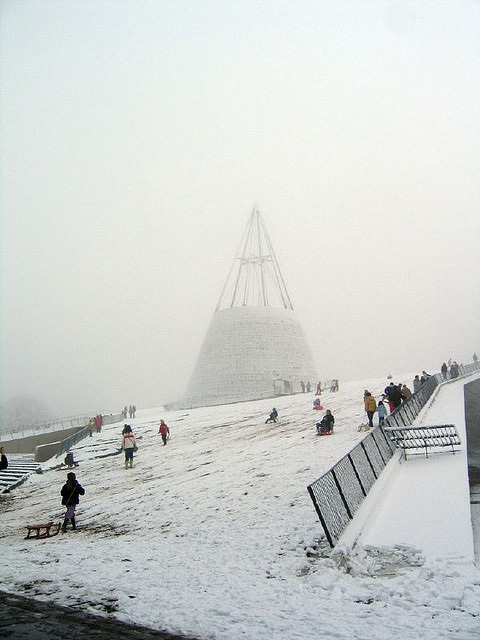 I live in Holland which is very flat, so there's nowhere for the kids to go sledding when it snows. However, the Technical University of Delft has a library that's a sort of modern architecture grass-roofed four-story gently-sloping hill. When it snowed a week ago I took a few pictures showing the kids going crazy sledding down the library. Mt. Everest amongst the polders. So perhaps not only can this building open up new multi-use strategies for urban open spaces but also, one hopes, inspire Alps-less and Rockies-less cities to create viable bids to host the Winter Olympic Games. Mt. Fuji or the Arctic Circle need not have to be nearby. A bit of artificial snow and some dramatic re-contouring of terrain, and cities unblemished by tectonic uplifts can compete with the likes of Salzburg, Sochi and Jaca. Chicago, for instance. Here at Pruned HQ, a new Delftian library could serve as the venue for aerial and moguls freestyle skiing. Or the halfpipe. Instead of taking a ride on ski lifts, alpine skiers will instead ride on elevators in the city's newest skyscraper up to their starting gates before slamming down on the building's sloping façades. And rather than through a forest of Christmas trees populated by reindeers and other cute woodland creatures, cross country skiers will navigate their way through restored prairie flora and reanimated Pleistocene megafauna at Millennium Park v2.0, a new sprawling green roof covering subterranean parking garages, railyards and even the West Loop segments of the Dan Ryan, Kennedy and Eisenhower Expressways. No doubt Chicago's Pritzker family will ask their lackey Frank Gehry to design the luge, skeleton and bobsled tracks to be sited at this new park. And why not a hockey stadium arena atop the figure ice skating venue atop the speed skating tracks atop the Medal Ceremony Plaza right on Block 37, further densifying downtown. The Über-Loop. In other words, the first truly urban winter olympics, one that will also please the legacy-minded IOC when it comes to post-games use. One also hopes that the monopolistic hold on Olympic master planning by the big landscape architecture firms (Sydney/Hargreaves Associates; Beijing/Sasaki; London/EDAW) can be broken finally, allowing for mid-size and emerging studios to be hired. This is just awesome. I love your blog, by the way. It's just amazing and totally entertaining. So, thanks. Perhaps Studio Gang's 2004 Venice Biennal project was onto something? A rooftop stadium in the middle of the Loop could be the perfect venue for curling, an exciting spectacle for workers in the surrounding skyscrapers. Your blog is smart and fascinating. I'm finding interests in things I had no idea I was interested in....thanks. I'm late but I just saw your pics here. 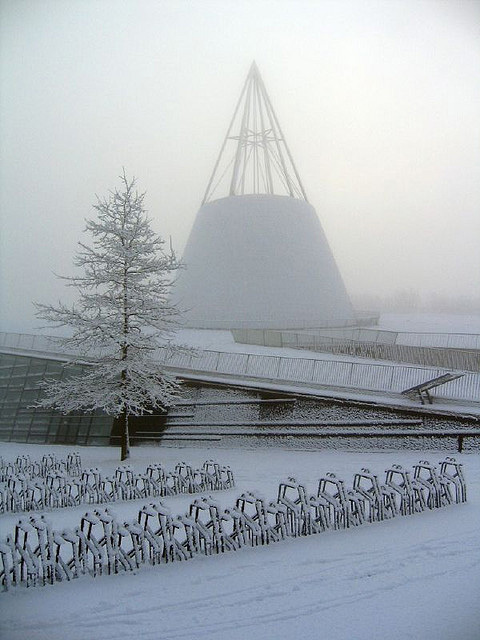 I've been to the library last spring and these pics just made me think of my time in Holland and my desire to study in TU Delft! I hope I'll go in 1-2 years! Really thanx for the beautiful pics you shared! See also the lawns on the roof of New Parliament House, in Canberra, Australia.